In the mid-nineteenth century, at the time of European settlement, Bridled nailtail wallabies were collected on a number of natural history expeditions (eg Gould 1863, Krefft 1866 cited by Fisher 1998), and were reported to be relatively common specialy in the west of the Great Divide. Along with other medium-sized mammals, they represented a major food resource for Aborigines, and were one of the most abundant wallabies in many areas (Gould 1863, Krefft 1866, Tunbridge 1991 cited by Fisher 1998). However, they declined virtually to extinction between 1900 and 1925 (Fisher 1998). The Bridled nailtail wallaby was thought to be extinct, but was rediscovered in 1973 by a fencing contractor who reported the presence of a population near the town of Dingo (Gordon and Lawrie 1980 cited by Fisher 1998). The property was purchased by the Queensland National Parks Service in 1979, and protected as a conservation reserve (Taunton National Park (Scientific)). Most of the range of the current population is within Taunton National Park (Scientific), but there have been sightings of bridled nailtail wallabies on some other properties within 25km of the park during the last ten years (Fisher 1998). 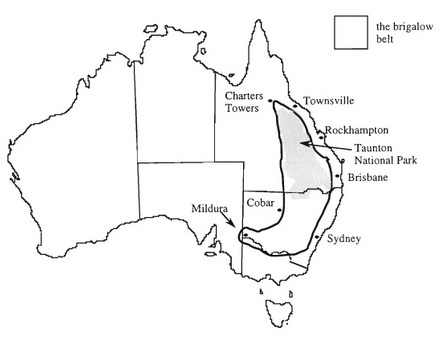 You can see the location of the Taunton National Park on the map (Fisher 1998) above. It belongs to a biogeographic region called "The Brigalow Belt" which consists of wide band of acacia wooded grassland that runs between tropical rainforest of the coast and the semi-arid interior of Queensland, Australia. In the past: It is believed that the agents of decline of Bridled naitail wallaby may have included clearing, sheep and cattle grazing, rabbits, foxes, cats, other habitat alteration, and persecution by humans. However, the speed and scale of the decline makes it impossible to identify any one predominant causal factor (Lundie-Jenkins & Lowry 2005). In the present: Competition with domestic herbivores (mainly sheep and rabbits), Drought, Disease & parasites, Exotic weed invasion, Fire, Predation (foxes, feral cats, dingos) and Habitat alteration/ degradation. Although threats to existing populations, located on land that is now protected and managed by QPWS are still evident, the level of threat has been significantly reduced (Lundie-Jenkins & Lowry 2005). The disappearance of the species from over 95 percent of its former range and the potential threat to the only known significant population from stochastic events such as wildfire, prolonged drought, over-predation and disease means the bridled nailtail wallaby is currently threatened with extinction. The species is considered to be endangered (Kennedy 1992) and is listed as such under both Federal and Queensland legislation (Environment Protection and Biodiversity Conservation Act 1999; Nature Conservation Act 1992 – Nature Conservation (Wildlife) Regulation 1994, Schedule 2) (Lundie-Jenkins & Lowry 2005).